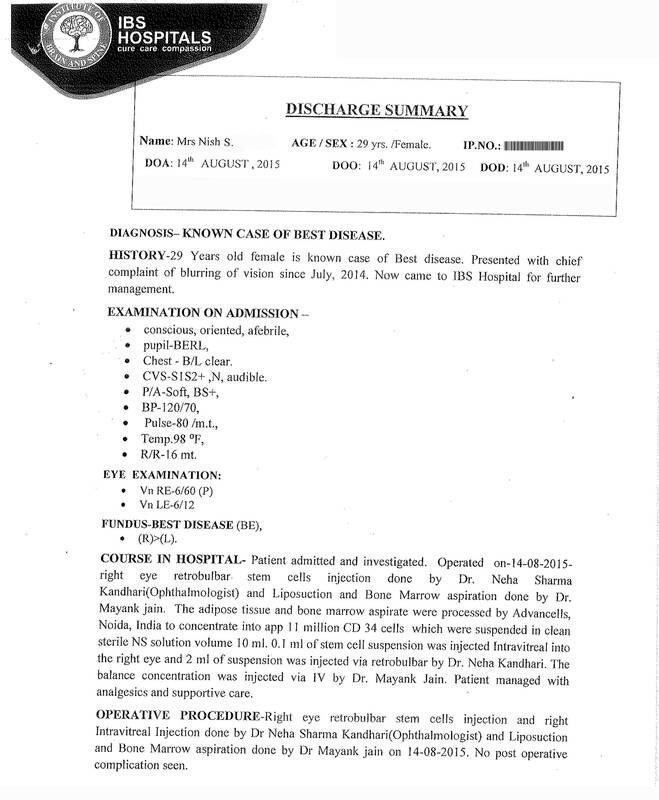 Nish S from Africa a 29 year old female patient is suffering from Hereditary form of Best Disease also known as Vitelliform Macular Dystrophy. The patient showed typical symptoms of the disease including loss of central vision and diminishing peripheral vision. Her right eye was affected more than the left eye. The patient agreed to undergo Autologus Bone Marrow + Adipose Tissue Stem Cell transplant. It was decided that the cells will be transplanted Intravitreal and via Retrobulbar injection only in the right eye. It was also decided that any remaining quantity of the cells will be given via IV to the patient along with growth factors. Approximately 180ML of Bone Marrow was aspirated from the patient from the illiac crust and approximately 200ML of Adipose tissue was aspirated from the belly area in OT setting. Patient tolerated the procedures well under local anesthesia and sedation. Stem Cells were separated from the sources (Bone Marrow and Adipose Tissue) at Advancells ultra modern lab and final volume of 4ML adipose tissue SVF and 6ML of Bone Marrow concentrate was transported back to hospital in sterile, temperature controlled manner. Once in the hospital, 0.1ML of Adipose stem cell solution was given Intravitreal in the right eye and remaining solution was given via Retrobulbar injection. Bone Marrow concentrate along with plasma growth factors were injected via IV. Patient tolerated the procedures well without any complaints and was discharged the same night. Patient presented herself for follow up 48 hours after the procedure and local examination revealed normal eye pressure and no apparent discomfort. Patient reported slight haziness in vision which is to be expected. Patient was able to easily pass the finger counting test and the vision stood at the same position where it was before the procedure. Patient presented herself for follow up 10 days post procedure. 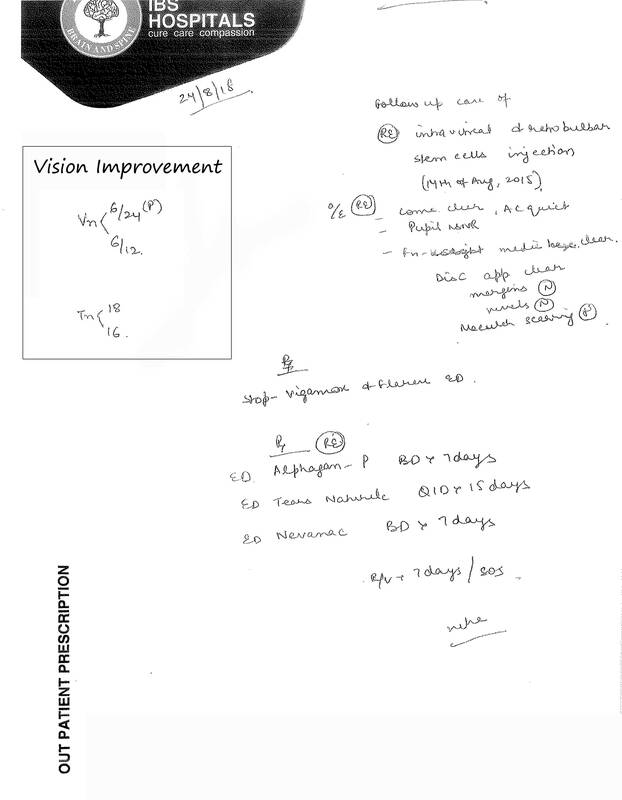 The haziness in the vision was almost gone and the patient was able to read the eye chart to the third line which she was not able to do before the procedure. Examination revealed stable eye pressure and improvement of vision to 6/24. Patient has been advised to return home and continue monitoring eye pressure and vision examinations with the local ophthalmologist. Patient has also been advised a follow up 3 months post procedure.